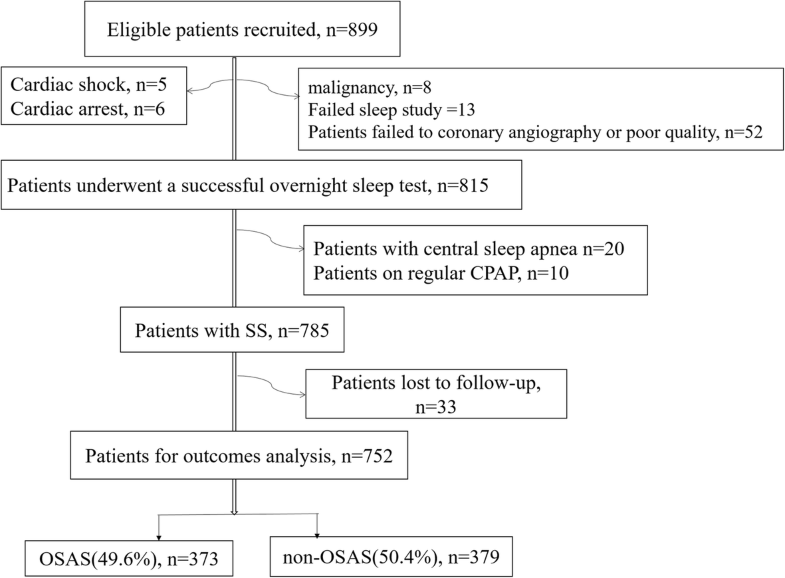 There is a paucity of data from large prospective study evaluating the prognostic significance of the residual Synergy between percutaneous intervention with Taxus drug-eluting stents and cardiac surgery (SYNTAX) Score (rSS) in patients with obstructive sleep apnea (OSA) and Acute Coronary Syndrome (ACS). ACS patients who undergoing percutaneous coronary angiography and completing a sleep study during hospitalization were prospectively enrolled. 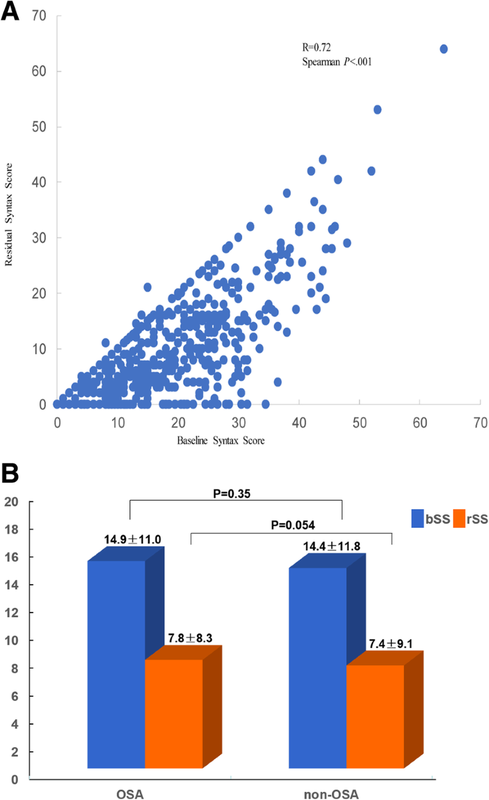 The baseline SYNTAX Score (bSS) and the rSS after revascularization were assessed. Complete revascularization (CR, rSS = 0) and incomplete revascularization (ICR, rSS > 0) were categorized. OSA (apnea hypopnea index, AHI ≥ 15) and non-OSA (AHI < 15) were grouped according to AHI. The primary endpoint of the study was major adverse cardiovascular and cerebrovascular events (MACCEs), defined as a composite of cardiovascular death, myocardial infarction, stroke, ischemia-driven revascularization, or hospitalization for UAP or heart failure. Overall, 752 patients were prospectively enrolled. At a median follow-up of 1 year, the incidence of MACCEs was significantly higher in the OSA than in the non-OSA group (hazard ratio [HR]:1.68; 95% confidence interval [CI]:1.04–2.72; P = .034). ICR was associated with a higher risk of MACCEs in the non-OSA group (HR:3.34;95% CI:1.0–11.12; P = .05). The OSA patients with ICR had a 5.1 higher risk of MACCEs compared with the non-OSA with CR group, P = .007. The OSA patients with CR had a similar 1-year MACCEs as all the non-OSA patients (HR:1.10; 95% CI:0.515–2.349; P = 0.806). ACS patients with OSA and ICR have a high rate of MACCEs at 1 year. In contrast, the prognosis of ACS patients with OSA but CR is favorable and similar to patients without OSA. Adequate level of revascularization is recommended to optimize clinical outcomes in ACS patients with OSA. OSA (Obstructive Sleep Apnea) characterized by repeated hypoxemia at night, may promote the occurrence and development of cardiovascular disease through the activation of sympathetic system, inflammatory reaction, oxidative stress and metabolic abnormalities [1–3]. OSA has been advocated as a new emerging independent risk factor for coronary artery disease by America expert consensus documents and Europe clinical guidelines [4–6]. It has been confirmed recently in a large prospective cohort study . Intravascular Ultrasound has further demonstrated those patients with OSA present greater plaque burden . However, the relation between cardiovascular outcomes and OSA still remain debatable even in randomized trials [4, 9, 10]. The Synergy between percutaneous intervention with Taxus drug-eluting stents and cardiac surgery (SYNTAX) score has been developed to stratify the complexity and severity of coronary lesions . Residual SYNTAX Score (rSS) was derived from SYNTAX score to quantify the burden of residual coronary artery disease after percutaneous coronary intervention (PCI) or coronary artery bypass graft (CABG), and has been validated as an independent predictor for clinical adverse events [12–14]. However, studies examining the impact of rSS on patients with OSA and acute coronary syndrome (ACS) have not yet been elucidated. The objective of the present study was to evaluate the prognostic impact with rSS in patients with OSA and ACS in a prospective single center cohort study. The OSA-ACS project (NCT03362385) was a prospective, single-center, observational cohort study that recruited consecutive patients with ACS diagnosis at Beijing An Zhen Hospital, Capital Medical University, Beijing, China from May 2015 to June 2017. A total of 899 eligible ACS patients who have undergone overnight portable sleep study were eligible for inclusion. ACS includes ST-segment elevation myocardial infarction (STEMI), none ST-segment elevation myocardial infarction (NSTEMI), and unstable angina pectoris (UAP). Inclusion criteria: i) age ≥ 18 years old and < 85 years old. ii) ACS. Exclusion criteria: i) cardiogenic shock; ii) cardiac arrest; iii) history of malignancy; iv) failed sleep study; v) failure of coronary angiography or poor quality; vi) central sleep apnea; vii) known OSA and continuous positive air pressure (CPAP) treatment. The study was approved by the Institutional Review Board of Beijing Anzhen Hospital, Capital Medical University and all patients provided written informed consent. The sleep studies were conducted with a portable diagnostic device (Apnealink Air, Resmed, Australia) for more than 7 h during the night after admission by a trained research team. Nasal airflow, thoracic-abdominal movements, arterial oxygen saturation, heart rate, and snoring episodes were recorded. According to apnea hypopnea index (AHI), patients were categorized to 2 groups: OSA group (AHI ≥ 15 events/h), non-OSA group (AHI < 15 events/h). For the patients with moderate to severe sleep apnea (AHI ≥ 15), particularly those with excessive daytime sleepiness, we referred them to sleep center for further evaluation and consideration of CPAP therapy. The decision of PCI strategy and stenting were left to the discretion of the operator. Dual antiplatelet therapy with aspirin and P2Y12 receptor inhibitor (i.e. clopidogrel or ticagrelor) were recommended for at least 12 months according to the current standard guidelines. All patients were followed up routinely in outpatients or by phone at 1 month, 3 months, 6 months, 12 months, and every 6 months thereafter. Basic SYNTAX Score (bSS) and rSS were calculated by 2 experienced interventional cardiologists who were blinded to the clinical outcomes and the sleep patterns of the patients using a web-based calculator (www.syntaxscore.com), and disagreement was resolved by consensus. Lesions with > 50% diameter stenosis in vessel ≥1.5 mm in diameter were scored using the SS algorithm described previously. The rSS was defined as the remaining SYNTAX Score after PCI or CABG. In the case of staged PCI procedures, the final planned procedure was used to calculate the point for rSS. For the patients who underwent CABG, the rSS was scored by comparing the bSS with the surgical procedure reports, the same, the final decision was made by consensus in cases of disagreement between the 2 cardiologists. Moreover, each vessel disease was still scored in terms of vessel characteristics (tortuosity, severe calcification) or any residual lesions distal to the graft allocation . Patients were then classified into 2 groups based on the points of rSS: complete revascularization (CR): rSS = 0; incomplete revascularization (ICR): rSS > 0 . The intra-observer variability of the bSS and rSS using the intraclass correlation analysis were 1.0 (0.99–1.0), P < .001 and 0.98 (0.95–0.99), P < .001. The inter-observer variability of the bSS and rSS was 1.0 (0.99–1.0) and 0.99 (0.99–0.99) respectively, both P < .001. The primary endpoint of the study was major adverse cardiovascular and cerebrovascular events (MACCEs), defined as a composite of cardiovascular death, myocardial infarction, stroke, ischemia-driven revascularization, or hospitalization for UAP or heart failure. Continuous data were expressed as mean ± standard deviation (SD) and compared using the Student t test. The chi-square or Fisher’s exact test was used for comparison of categorical variables. Clinical outcomes were determined using Kaplan-Meier method and compared using the log-rank test. Cox multivariate regression analysis was used to determine the independent predictor of clinical events, with variable entry/stay criteria of 0.1/0.1. Interclass correlation coefficient (ICC) was used to assess the inter-observer (Zeng Y and Yang S) and intra-observer agreement of bSS, as well as rSS after PCI or CABG with 95% confidence intervals. An ICC < 0.4 indicates bad agreement, an ICC between 0.4 and 0.75 indicates moderate agreement, and ICC values > 0.75 indicates excellent agreement . A P value < .05 were considered statistically significant. Statistical analyses were performed using SPSS version 22 (IBM Corp, Armonk, NY). The study flowchart was shown in Fig. 1. From May 2015 to June 2017, 752 eligible patients were prospectively included in the analysis. Overall, mean age was 57.2 ± 10.2 years, 82.6% were male and 30.6% were diabetes. STEMI, NSTEMI, UAP according to the Braunwald classification were the clinical presentation in 32.3, 25.1 and 42.6% of the population respectively. The mean bSS and rSS was 14.6 ± 11.4 and 7.6 ± 8.7. The cohort’s baseline demographic and clinical characteristics were listed in Table 1. OSA was observed in 49.6% of the population. Mean oxygen saturation (SO2) in the OSA (93.0 ± 2.3%) was lower than in the non-OSA group (94.6 ± 1.7%, P < .001). Interestingly, multi-vessel diseases were more frequently observed in the OSA than in the non-OSA cases (three vessel disease: 27.3% vs 22.7%; two vessel disease: 38.3% vs 32.2%, overall P = .024). Similarly, chronic total occlusion lesions (CTO) in the OSA (23.6%) was more than in the non-OSA group (15.3%), P = .004. Finally, more stents (1.0 ± 1.0) were implanted in the OSA than in the non-OSA group (0.8 ± 1.0), P = .046. The correlation and distribution of the bSS and the rSS were showed in Fig. 2a. The bSS was strongly positively correlated with the rSS (R = 0.72, p < 0.001). The frequency of patients with ICR increased across the bSS, while the frequency of CR decreased across the bSS. The mean follow-up was 1 year. The total MACCEs rate was significantly higher in the OSA than in the non-OSA patients (12.3% vs 6.9%; hazard ratio [HR]: 1.68; 95% confidence interval [CI]: 1.04–2.72; P = .034). However, there were no difference in the rate of ischemia-driven revascularization between the OSA and non-OSA groups (16, 4.3% vs 10, 2.6%, p = 0.215). Table 2 showed the different clinical outcomes at follow-up for subgroups of the rSS. ICR was associated with a higher risk of MACCEs in the non-OSA group (HR: 3.34; 95% CI: 1.0–11.12; P = .05). ICR had a 5.1 higher risk of MACCEs at follow-up compared with the non-OSA with CR group, P = .007. Figure 3 demonstrated that the OSA patients with CR (9/104,8.7%) had a higher 1-year MACCEs compared to the non-OSA and CR patients (3/102, 2.5%), (HR: 3.0; 95% CI: 0.79–11.42; P = 0.11), the p value was not significant. Interestingly, the OSA patients with CR had a similar 1-year MACCEs as all the non-OSA patients (HR: 1.10; 95% CI: 0.515–2.349; P = 0.806). There was also no significant difference in the 1-year MACCEs rate in the OSA and in the non-OSA patients with CR (HR: 3.1; 95% CI: 0.84–11.5; P = 0.09). The MACCEs in all patients was mainly driven by hospitalization for UAP. In patients with OSA, the rate of hospitalization for UAP was higher in the ICR than in the CR subgroup (HR: 6.73; 95% CI: 1.61–28.2; P = .009). The same was also true in the non-OSA group (HR: 6.0; 95% CI: 0.79–45.6; P = .084), although the P value was not significant. Multivariate analysis demonstrated that OSA (HR: 1.65; 95% CI: 1.02–2.67, P = .044) and rSS (HR: 2.04; 95% CI: 1.09–3.8, P = .025) were two independent predictors of the MACCEs at follow-up (Table 3). The findings of the present study can be summarized as follows: 1) OSA with ACS patients were associated with a 2-fold higher risk of MACCEs than in those non-OSA; 2) compared to the non-OSA patients, OSA with ACS patients presented more severe coronary artery disease; 3) the Residual SYNTAX Score was able to stratify the OSA patients with ACS; 4) incomplete revascularization was associated with high clinical events in the OSA patients with ACS. OSA has been advocated as a new independent risk factor for coronary artery disease [4–6]. However, the link between cardiovascular events and OSA is still controversial  because of the following reasons: (1) most of the studies were observational ones for both ethical and logistical reasons. Symptomatic cases will benefit from long-term CPAP, which was challenging to make OSA patients free from treatment; (2) CPAP treatment adherence of patients was important to guarantee the beneficial effect . Studies showed beneficial effects of CPAP only in those who used CPAP for 4 to 6 h/night or longer [9, 18]; 3) OSA treatment effect might be confounded by a treatment bias, those with severe symptoms might also adhere to diet, exercise and other drugs better than those without or mild symptoms. Thus, the net beneficial effect of OSA treatment was difficult to draw . Therefore, compelling causal evidences between OSA and cardiovascular events are still lacking. In the prospective study including a large Chinese ACS population in real-world, the prevalence of OSA was approximately 50%, which is similar to that reported in previous studies . We demonstrated that OSA was associated with a 2-fold increased risk of MACCEs compared with the non-OSA patients, which was mainly driven by unstable angina pectoris. Elucidating the effects of OSA on the coronary angiographic characteristics is the fundamental pathologic substrate to understand the underlying effects on cardiovascular events. OSA was reported to be associated with more multi-vessel disease, more severe coronary artery calcification, as well as more ST segment depression [20–22]. Our findings were consistent with the literature: higher frequency of three-vessel disease, two-vessel disease were observed in the OSA patients. We added further evidence that the OSA patients with ACS presented with more chronic total occlusion lesions, which finally led to more stent implantation comparing with the non-OSA patients. The possible mechanisms might include vascular endothelial injury, insulin resistance, sympathetic activation, neurohumoral changes, inflammation, oxidative stress, dyslipidemia through chronic intermittent hypoxia [23–25]. The disorders of metabolic function mentioned above ultimately induced or accelerated the process of coronary artery disease. Several scoring systems have been developed to evaluate the complexity of coronary artery disease. Gensini score was deprived for each coronary stenosis on the basis of the degree of luminal narrowing and its topogtaphic importance . SYNTAX score takes into account not only the luminal narrowing, but also other anatomic aspects, including bifurcation, trifurcation lesions, calcification, tortuosity, thrombus, and occlusions etc. Residual SYNTAX Score deriving from SYNTAX Score was used to quantify the residual burden of coronary artery disease after revascularization [12–14]. ICR was a surrogate marker of patients with more anatomically complex baseline disease. We found in the present study that ICR was more frequently observed in the OSA patients with ACS compared with those non- OSA. This implicates complex coronary lesion in the OSA patients and would predict worse prognostic events. Previous studies have demonstrated that incomplete revascularization after either PCI or CABG was at a high risk of MACCEs in heterogeneous patients including ACS, STEMI, NSTEMI, multi-vessel disease and complex lesion [27–31]. However, studies evaluating the impact of rSS in patients with OSA and ACS have not yet been elucidated. We assessed for the first time the prognostic effect of rSS on clinical outcomes in a large prospective study. We found that ICR was associated with a 2-fold higher risk of MACCEs compared with CR in the OSA group. The OSA patients had a similar 1-year MACCEs as all the non-OSA if the revascularization was complete. Similarly, there was also no significant difference in the 1-year MACCEs rate in the OSA and the non-OSA patients if the revascularization was complete in both groups. There were several limitations in the study. Firstly, the non-randomized design of the study will preclude the conclusion. Secondly, the follow-up was relatively short to observe the incidence of long-term events. Thirdly, the sample size was relative small in subgroup analysis. Fourthly, rSS was based on angiographic interpretation that has inherent limitations . However, rSS was assessed by consensus of well-trained analysts with good reproducibility. In addition, the strategy of PCI or CABG in the present study was decided by a heart team consisting of cardiac surgeons and cardiologists in one center, this reduces the potential confounder of operator discretion. Fifthly, residual SS was not calculated based on functional evaluation with fractional flow reserve, however, the latter has not been implemented routinely in multi-vessel disease in China. ACS patients with OSA and ICR have a high rate of MACCEs at 1 year. In contrast, the prognosis of ACS patients with OSA but CR is favorable and similar to patients without non-OSA. Adequate level of revascularization is recommended to optimize clinical outcomes in ACS patients with OSA. This work was supported by: International Science & Technology Cooperation Program of China (2015DFA30160), Beijing Municipal Administration of Hospitals Clinical Medicine Development of Special Funding Support (ZYLX201710), National Natural Science Foundation of China (81800309), Beijing Municipal Administration of Hospitals’ Youth Program (QML20170604). National Natural Science Foundation of China (81600209), Beijing Municipal Administration of Hospitals’ Youth Program (QML20160605). YZ and SY contributed to the SYNTAX analysis and manuscript writing. XW and JF contributed to the statistical analysis. SN and YW contributed to the design of the study and the manuscript writing. The authors thank Drs. Wen Hao, Guanqi Zhao, Shenghui Zhou, Aobo Li, Ruifeng Guo, Han Shi, and Zexuan Li for their help in data collection. All authors read and approved the final manuscript. The study was approved by the Institutional Review Board of Beijing Anzhen Hospital, Capital Medical University (2013025) and all patients provided written informed consent. All the authors consent to the publication of the manuscript.